Trujillo (Peru): Pope Francis denounced femicides and other gender-based crimes that have turned Latin America into the most violent place on Earth for women, calling for legislation to protect them and a new cultural mindset as he visited one of Peru's most dangerous parts. At a Marian prayer in the northern seaside city of Trujillo, Francis called women, mothers and grandmothers the guiding force for families. And yet, he said, in the Americas they are too often victims of murder and "many situations of violence that are kept quiet behind so many walls." The first Latin American pope called for lawmakers to protect women and for a new culture "that repudiates every form of violence." His remarks came the same day large crowds marched throughout the United States and other countries in support of female empowerment. Francis' use of the term femicide, the killing of women where the motive is directly related to gender, marked the second time in as many days that he has spoken out against "machismo" culture in Latin America. The region has the dubious honour of having the world's highest rates of violence against women occurring outside romantic partnerships, and the second-highest within. Even though more and more countries in the region are adopting protective policies for women, female homicides are rising in Latin America with two in every five resulting from domestic violence, according to a November 2017 report from UN Women and the UN Development Program that called the phenomenon a "global pandemic." In recent years women have taken to the streets across Latin America, including in Peru, to protest gender violence as part of the international "Ni Una Menos" or "Not One Less" campaign. In the Peruvian Amazon this week, Francis denounced forced prostitution and the trafficking of women in the area, saying it pained him how they are "devalued, denigrated and exposed to endless violence. "Violence against women cannot be treated as 'normal,' maintaining a culture of machismo blind to the leading role that women play in our communities," he said Friday. "It is not right for us to look the other way and let the dignity of so many women, especially young women, be trampled upon." Francis' decision to directly address the issue followed a reticence to speak out last year when he visited Ciudad Juarez, the Mexican border city notorious for hundreds of killings of women that brought international attention to the problem. More than 100 women died in eerily similar killings in the city across from El Paso, Texas, starting in 1993, although the serial or copycat nature of them tapered off a decade later. At a 2016 open-air mass in Juarez, Francis made an emotional plea to recognise the "human tragedy" of the treatment of migrants but made only a passing mention of the women's killings. At the time he did not use the word "femicide," saying only, "And what can we say about so many women who have unjustly had their lives taken?" 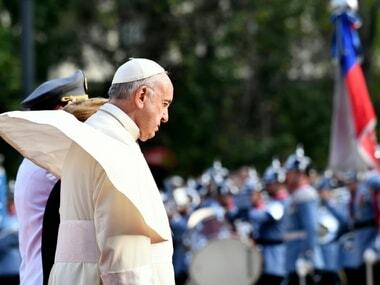 Mothers of some of the Juarez victims had sought unsuccessfully to meet with Francis, and Saturday marked the first time he is known to have used the term "femicide" in public. Central American countries have the highest rates of gender-based violence, but the issue is also a serious problem in Peru. More than 1,000 women died from gender violence in the South American country from 2009 through last October the vast majority murdered by a partner or relative according to a report by the Public Ministry. Francis' comments came in his final event in Trujillo, where devastating floods last year killed more than 150 people and destroyed hundreds of thousands of homes.